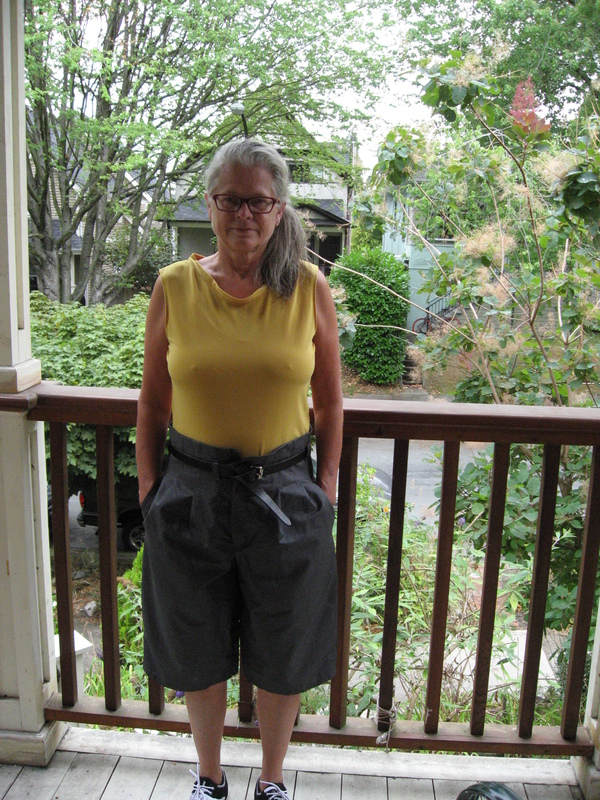 I just made two wrap skirts, using the Vogue pattern that also included the shorts I blogged about last time. I guess, since it’s a 1992 pattern, it qualifies as “retro”. There’s nothing retro about this wrap though — to my mind it’s pure classic and timeless. The first was a wearable toile. I used an old scrap of fabric mostly to check waist and hip fit. 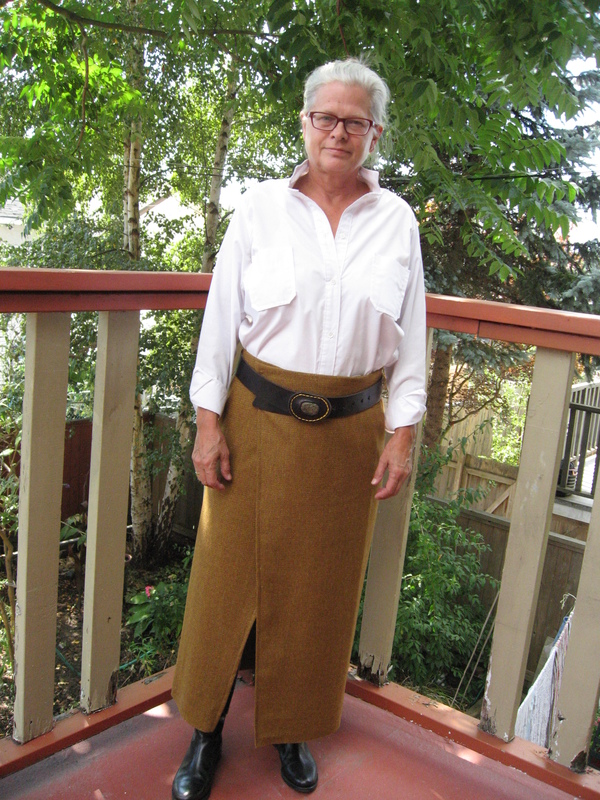 The skirt has only two pieces, which join at the centre back. The pattern provided four darts per side. I discovered I didn’t need the front darts, and had to halve the side darts. I also lowered the front a half inch or so. I always have to lower the front waist of anything I make. The pattern also came with a facing (the skirt is not meant to be lined). Well, I mucked around at first trying to create a new facing to incorporate my changes, but that eventually seemed hopeless. So I thought I would just make the skirt again, and call it a lining. Here’s the result. I was a little concerned that the overlap could reveal too much, so I added a leather “tab”, which also dressed up this otherwise pretty plain number. I also left the selvege edge unfinished at the hem. This is a really easy skirt to wear. But I regret to say the result gave some foreshadowing of the problems that followed when I made the “real” skirt. For some reason that I still don’t know, the darts on one side of the skirt lining ended up facing inwards instead of outwards. And the right side is supposed to overlap the left. Mine is the opposite. 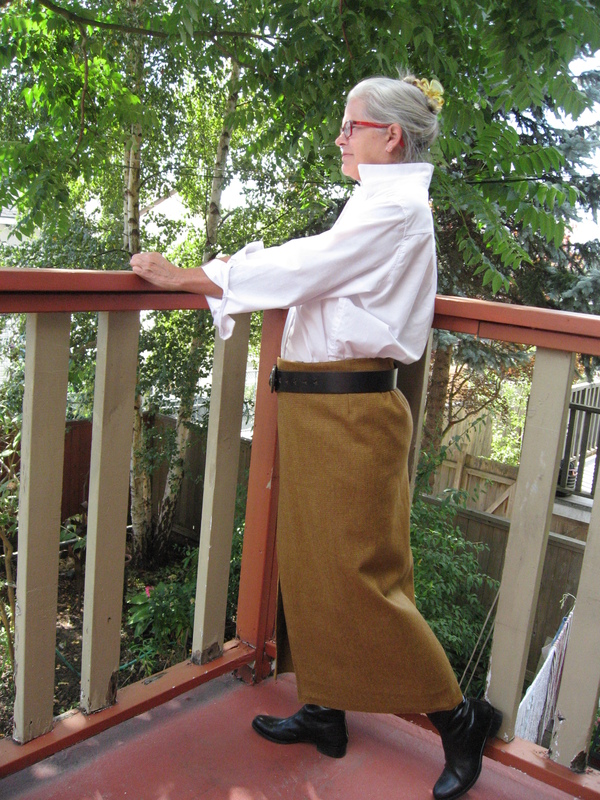 So, for the “real” skirt, I scavenged the fabric from one of the Thai fisher pants I wrote about a few weeks ago. 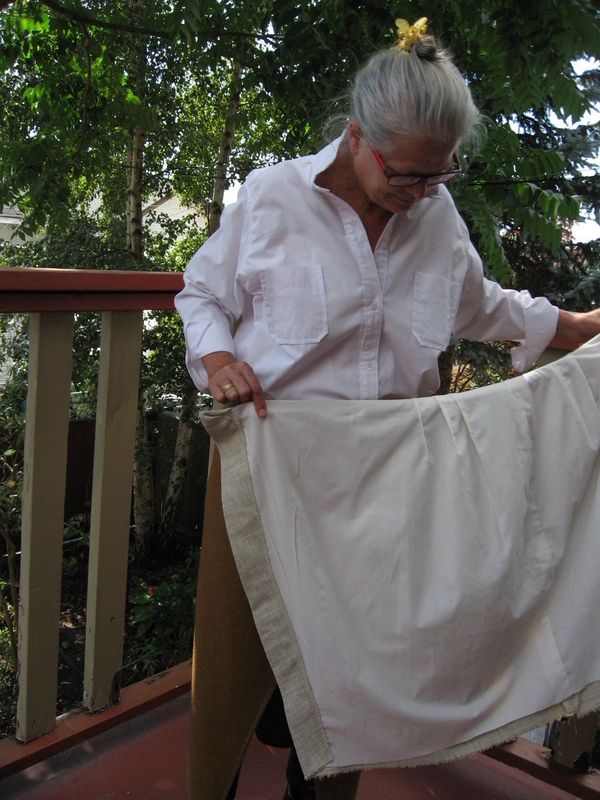 When I took the pants apart, I had two pieces of fabric just big enough for the two pieces of the skirt. This is fabric I love. Before cutting out the pieces I transferred the pattern pieces onto paper, with all the little changes included. I pinned these fresh, totally perfect, pattern pieces to the fabric and cut out both pieces. Then I discovered …. drum roll here … prepare for the horror …. both sides of the skirt went from centre back around to the right. Both sides. Waaaaah! Is anybody else as geometrically challenged as I am? I just can’t visualize how something two dimensional becomes three dimensional. I get lost in parking lots. I freak out in malls when I don’t know where the exits are. I have N, S, E and W engraved in my forehead where I live because it’s the only way for me not to get lost in a city I’ve lived in for 30 years. I think there’s something the matter with me. Really. I still can’t begin to understand how I made two pattern pieces for one side of the body only. I was able to salvage the skirt though. For the side that would be under in front, I added a little fabric remnant that I had, just overlapping it and sewing it to the large piece with a zigzag stitch. That gave me enough fabric to cut out the correct skirt half again, making sure it would go from centre back to the left. Then I had to try to make the two lining pieces correctly. It was hell! I ended up again with the darts on one side facing in instead of out. How is this possible! I’m really happy with the final product though. What do you think? I love this skirt. Isn’t it a classic? I can see modesty might be an issue though, so I’ll probably add a snap part way down the overlap? Or maybe just use a safety pin? 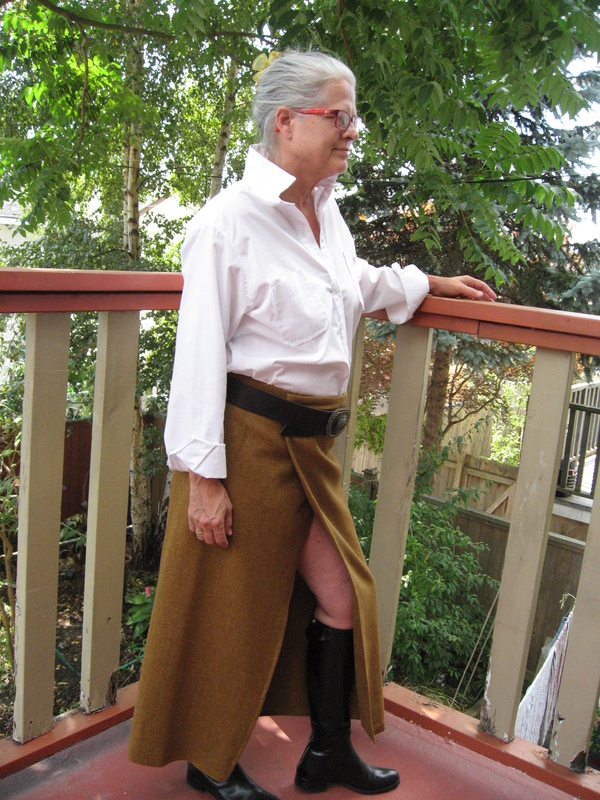 I didn’t hem the “real” skirt either, and don’t intend to. I topstitched close to the overlap edge, but discovered that made the fabric want to roll. So I inserted little strips of interfacing as a stabilizer and tried again. It worked! Cool. The things I learn from other bloggers! (I’m getting a lot of use of the exclamation mark key on my computer tonight, aren’t I?) 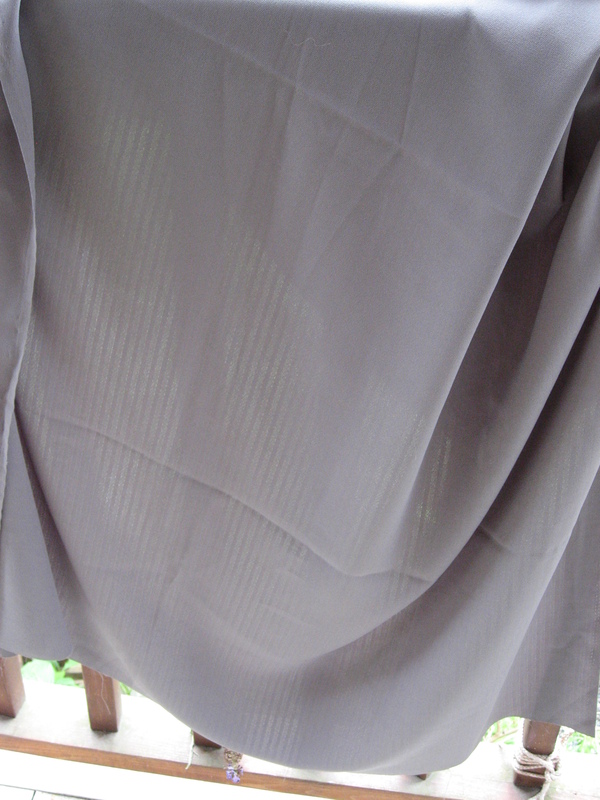 I’ll have to make a little more use of my steam iron to get the creases out of the bottom (left over from where the original Thai fishers were hemmed). A month or so ago someone told me about Our Social Fabric, a company that collects unwanted fabric and notions and opens up shop a few hours, a couple of days a month. Most fabrics sell for a dollar or two a yard. 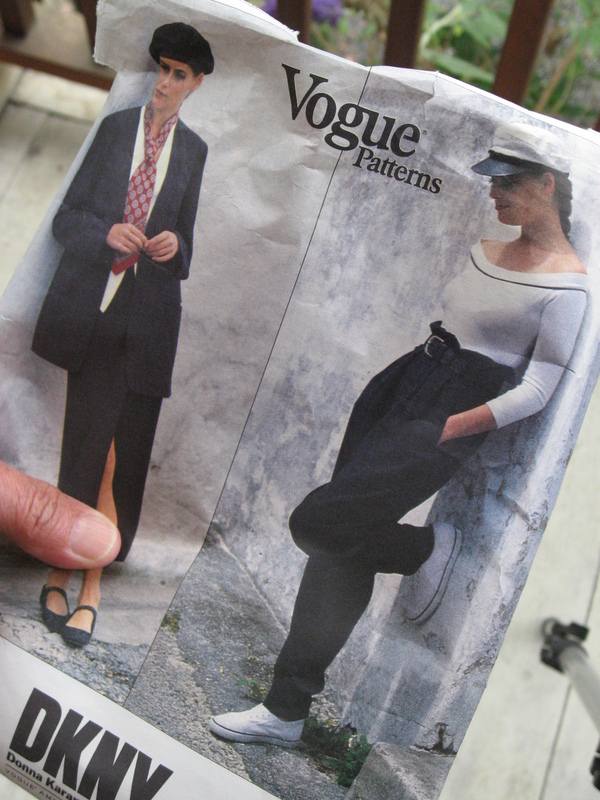 I picked up quite a few pieces of fabric, including a bit of crisp cotton chintz and an old Vogue pattern — number 2938. I was particularly taken with the “paperbag” waist on the pants. 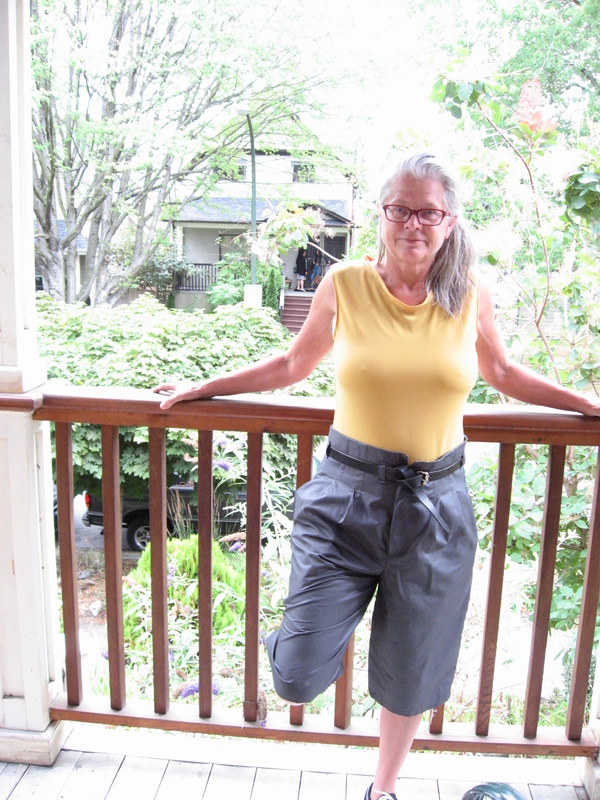 I’ve seen that waist recently in a magazine and have tried it on my own for a couple of pairs of pants, but I can’t say the results were stellar. I thought I would start with a pair of shorts as a sort of wearable toile, and if the results were good, move on to pants. I thought the cotton would work well with the pattern. There are a few problems. It turns out the cotton is very crisp. So much so that, despite the light weight, it doesn’t drape like I expected. 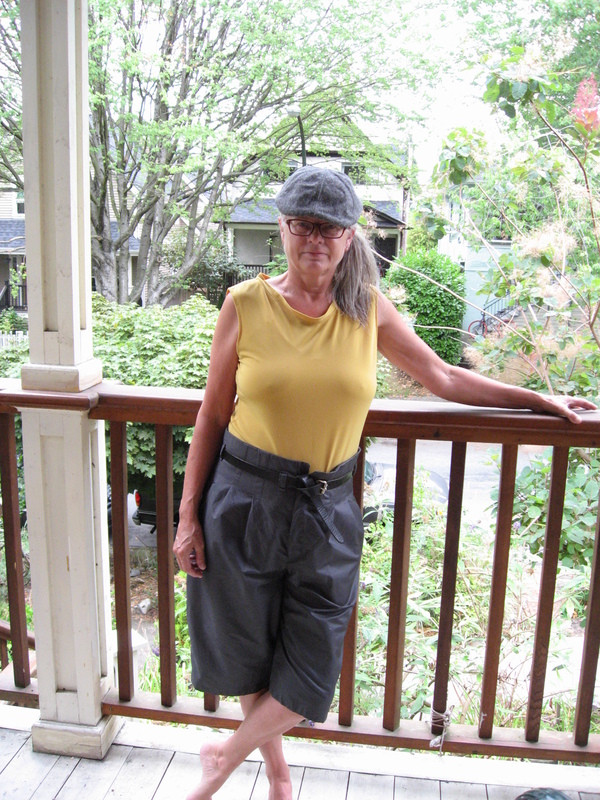 I had to take in the hips, of course, but it’s hard to know how much when there are front pleats. This fabric kind of bunches at the hips. The real problem is with my vision. I keep “seeing” those horrible jeans of a few decades back — they had front pleats and tapered down into narrow ankles. They were hideous, but the style for gawd knows how long. I haven’t worn front pleats since then. I can’t “see” what these shorts look like because of the interior image of those hideous jeans. So, what do these things look like? Retro-chic? Or just plain old-fashioned? The pattern package gives the date as 1992, which didn’t seem that long ago to me until I started counting. My lord, something 23 years old is beyond old-fashioned isn’t it? That’s old enough for retro, right? Gotta be. So, I don’t know whether I should try long pants or not. I think I’d have to alter the legs. Not have them taper, but stay wide. And use a fabric more drapey than the cotton? Like maybe this wool? I’m thinking ahead to winter. And I bought that wool, along with two other pieces of fine drapey wool at the same sale. This is a real problem with being old enough to have gone around all the fashion cycles a few times. I thought I would never wear front-pleated pants again. Ever. But I like drapey looks. So, what do you think? Should I go ahead and try pants, or forget about it? I hate using a pattern only once, but at least there’s a cool wrap skirt pattern also in the package that I’m going to try.